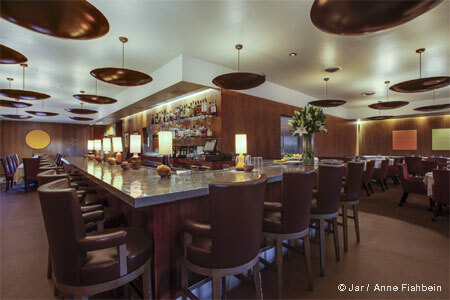 The Polo Lounge, a Beverly Hills legend since 1941, serves (too) classic cuisine in an elegant setting. Open daily 7 a.m.-11 p.m., Afternoon Tea Fri.-Sat. 3 p.m.-5 p.m., Jazz Brunch Sun. 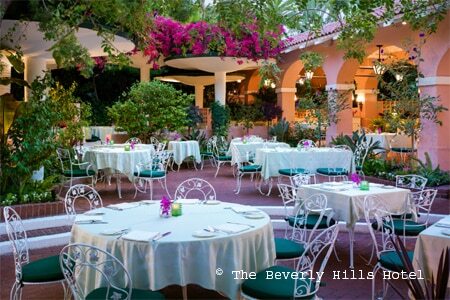 11 a.m.-4 p.m.
: Since its 1941 opening, the Polo Lounge at The Beverly Hills Hotel has been a favorite celebrity dining destination, and is probably the only restaurant in Beverly Hills that has earned so many glamorous adjectives for so long: legendary, elegant, classic and stylish. The Pink Lady's restaurant has welcomed the very famous and powerful, the famous and less famous at the bar, in the flowered patio, or in the dining room. There are some old timers on the menu like the tortilla soup and the Caesar salad, while sea beans and dukkah spice augment the standard ahi tartare. Main dishes might range from wild salmon with white asparagus, baby leeks, sherry-mustard vinaigrette and purple potatoes to a grass-fed filet with smoked yukon gold mashed potatoes, spinach and crispy potato. There is a cheese board, served with local honey and seasonal accompaniments (at the hefty price of $39). Sweets, such as the soufflé of the day, will conclude your evening. The New World occupies a very large part of the wine list, which features many verticals, but they are not for the cost-conscious.